US-based company Audix build some seriously good microphones, both for live performance and for studio recording, yet they never quite seem to enjoy the profile they deserve. Founded in Redwood City, California some quarter of a century ago, the company moved to their present location in Oregon in 1991. Rather than outsource their manufacturing, they invested in CNC (computer numerical control) machining equipment, which allows manufacturing costs to be kept under control while maintaining very tight tolerances. In this respect their approach seems to be not unlike that of Australian manufacturers Rode, who also chose to use state-of-the-art technology in order to keep the majority of their manufacturing in Australia. Both of the mics under review are housed in identical, 'cylinder' format bodies. They are very nicely finished in matte black, with a strong but acoustically transparent grille, in a style that rather reminds me of Audio-Technica's studio mics. The CX112B is a large-diaphragm, cardioid-pattern capacitor mic that the spec sheet suggests would be suitable both for studio use and live performance. The polar pattern is printed on the front of the mic body, along with the Audix logo, which denotes the 'hot' side of the mic. Based around a 35mm-diameter, centre-terminated capsule, the CX112B covers the nominal frequency range of 20Hz to 20kHz, with a generous presence peak centred at around 10kHz, adding around 6dB of boost in the 8kHz to 14kHz region. The mic has a switchable low-pass filter and -10dB pad, which allows it to work at SPLs of up to 148dB. 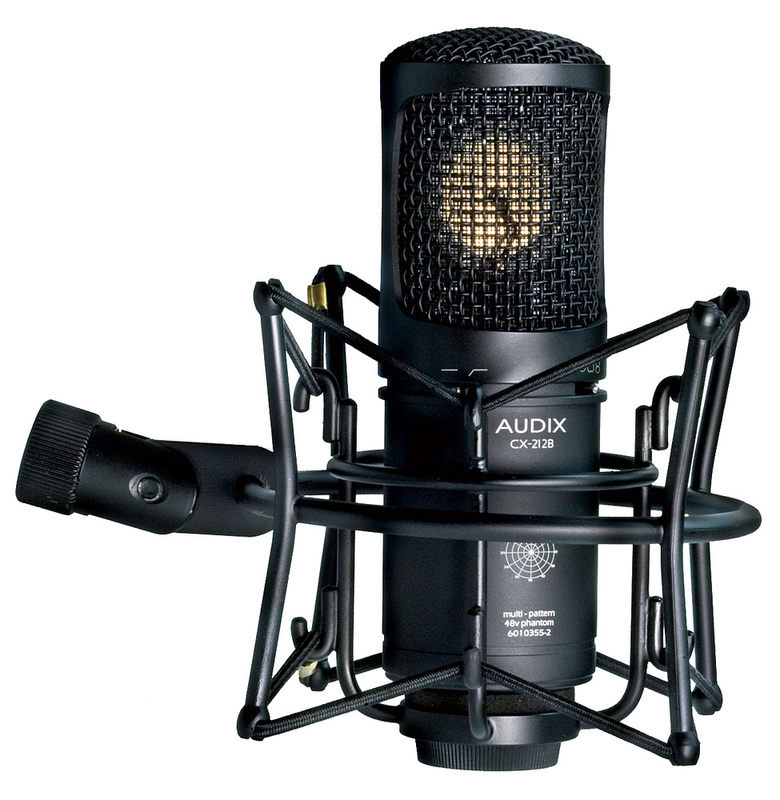 It seems Audix have done their best to make the CX112B a strong all-rounder: as well as the obvious vocal applications, they say it can be used as an ambient room mic, a guitar-cab mic or an ensemble mic. Its sensitivity is 18mV/Pa and the self-noise (EIN) is a respectable 16dB (A-weighted), both of which are typical figures for mics of this type. Both of these mics use discrete, low-noise FET preamp circuitry requiring standard 48V phantom power to operate. The CX212B offers three switchable patterns (cardioid, omni and figure-of-eight) and a low-cut switch, but no pad. Its self noise is a little higher than that of the CX112B, at 19dB (A-weighted), and the presence peak is slightly subtler (it also varies slightly, depending on which pattern is selected). The capsule seems to be similar to that used in the CX112B, except that here, two diaphragms are mounted back-to-back to provide the necessary patterns. While the CX112B is supplied in a foam-lined wooden box with only a rigid standmount clip included, the CX212B comes in an aluminium case with an adjustable standmount and a shockmount. The suggested applications cover all the bases of the cardioid CX112B, as well as tuned percussion, acoustic guitars, piano, drum overheads and choirs. The CX112B sounds very similar to the CX212B in the latter's cardioid mode, so the audio examples recorded for this review were done using just the CX212B (you can hear these files at /sos/articles/apr12/audix-cxmedia.htm). As you'd expect from the nature of the presence peak, these mics have an open, detailed sound, and they also tend to sound a little less congested at the low end than some large-diaphragm mics I've used. On vocals this translates to a well-balanced, clean delivery, while acoustic guitar benefits from the enhanced articulation provided by the high lift. The same qualities are evident with hand percussion: there's a nice sense of detail balanced by a solid but non-bloated low end. There's little evidence of harshness, though, as the high-end boost on both mics is well above that section of the mid-range that can sound aggressive when pushed. Though the CX212B's general tonality is retained when switching patterns, the inherent changes in proximity effect when changing pickup patterns mean that the low-end balance will be different at different settings, especially when close-miking. The proximity effect is greatest when in figure-of-eight mode, and the HF lift also changes as you switch patterns, being most pronounced in omni mode. Side rejection is good in figure-of-eight mode, and though omni mode isn't quite as well-behaved as a dedicated omnidirectional mic (the off-axis sounds inevitably lose a little top end, though the generous presence boost helps counter that), it works well, providing you keep the main sound source on axis. Moving on to electric guitar, the two Audix mics sounded noticeably different from the Audio-Technica AT4050 and SE Electronics SE2200A MkII that I was running alongside them. In fact, the difference between the Audix mics and the other two was far more noticeable when miking a guitar amp than it was on vocals or acoustic guitar. I tried both close-miking the amp and repeating the experiment at a distance of 1.5 metes, and both Audix models captured a sound that was more 'throaty' and had more of a biting edge than the other two mics. If I had to generalise, I'd say that the sound came over as being more American — European rockers tend to go for a 'creamier' electric guitar sound. Though EQ can be used to change the tonal balance, I'd say that out of the box the Audix mics would be best suited to US rock and metal styles, where you need power and attitude but without allowing the lows to get too flabby. It would certainly be nice to have one of these two mics in the locker to provide alternative flavours when recording electric guitar, as the resulting sound is absolutely right for certain heavier guitar styles. Summing up, then, both of these Audix mics are well made, they perform well and they have a distinctive character that can really help out in certain situations. They're particularly good for vocalists who need help with projection or maintaining clarity of diction, they pick out the transient detail in acoustic guitars and percussion, and they can deliver a rocky electric guitar sound with bags of attitude. Best of all, they're not too expensive. In this price range, there are far too many alternatives to list them all, though the AT4050 and SE2200A MkII I used in my comparisons are worth checking out. Clean sound with a tight but solid low end. Mics with a distinctive tonal character will always suit some sound sources better than others. 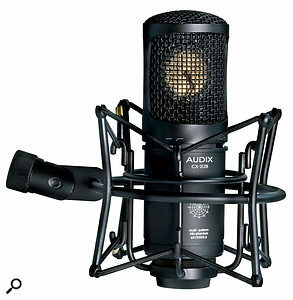 These two mics uphold Audix's reputation for offering quality at affordable prices. The tight, open sound of these models offers a useful alternative to microphones that add warmth at the expense of sounding a little unfocused, and should help keep sounds separate within a busy mix. CX112B £264; CX212B £348. Prices include VAT.